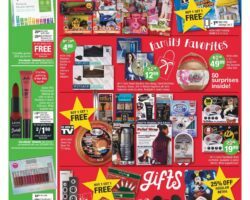 Check Out CVS Black Friday 2018 ad with sale starting Thursday, November 22 and available through Saturday, November 24. Stores open Thanksgiving Day. This year save on L.O.L. Surprise Big Surprise Ball, Seasonal Toys – includes ASTV, Train Set, Electronics, M&Ms, Hallmark Licensed Ornaments, Holiday Boxed Cards, Merry Brite Light Sets, Cosmetics and more. CVS Weekly Ad & Sales. Check out this week CVS Ad sale prices, printable coupons, current circular savings and latest specials. CVS is an online as well as a traditional supplier of drugstore and pharmaceutical products. The pharmacy offers a broad range of services, including online management of prescriptions with a CVS account, transfer of prescriptions from a non-CVS pharmacy to CVS and from one CVS pharmacy to another, and rapid refill as guest for in-store pickup as part of the online shop benefits. In store, CVS provides optometry services, hearing aid, and health care on customer schedule, in addition professional photo services and money transfer, with opportunities to save on a daily basis on drugstore items. In-store offers vary from CVS coupons to ExtraBucks rewards with select purchases. CVS rewards program includes 2% back for every purchase made with card and extra money off for the CVS weekly specials. Savings really add up with a rewards card and shopping with card exclusively saves customers substantially over purchasing full price or shopping at other drug stores.